Cincinnati, Ohio — Because of their constant commitment to make Red Wing, Minn., a better place for kids, Scott and Anne Jones are this year’s Cradle to Career Champions. 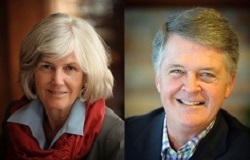 At its annual Cradle to Career Network Convening in Memphis, StriveTogether today announced the Joneses as the 2016 Bill Henningsgaard Cradle to Career Champion Award recipients. In Red Wing, Scott and Anne worked to start an education partnership, now known as Every Hand Joined. The pair secured a 10-year financing commitment from the board of their family foundation, and knowing the partnership would need strong leadership and support, Scott and Anne have continued to volunteer their time in facilitating networks, serving as leadership table members and securing additional funding. Every Hand Joined started in 2012, bringing together local businesses, nonprofits, city and county government, schools foundations and community members to improve education for local students. Within two years of existence, the partnership and Red Wing Public School District were recognized by Humphrey School of Public Affairs at the University of Minnesota as the winner in the school category for its 2014 Local Government Innovation Award. The award remembers Bill Henningsgaard for his work with Eastside Pathways, a StriveTogether Cradle to Career Network partnership in Bellevue, Wash. Henningsgaard, who died in 2013, advocated tirelessly for kids, rallying community partners to support every child throughout their education. The award is presented to an individual who embodies the passion, commitment and persistence in this work, as Henningsgaard modeled every day throughout his life. StriveTogether works with communities nationwide to help them create a civic infrastructure that unites stakeholders around shared goals, measures and results in education, supporting the success of every child, cradle to career. Communities implementing the StriveTogether framework have seen dramatic improvements in kindergarten readiness, standardized test results and college retention.